Ready for the future? 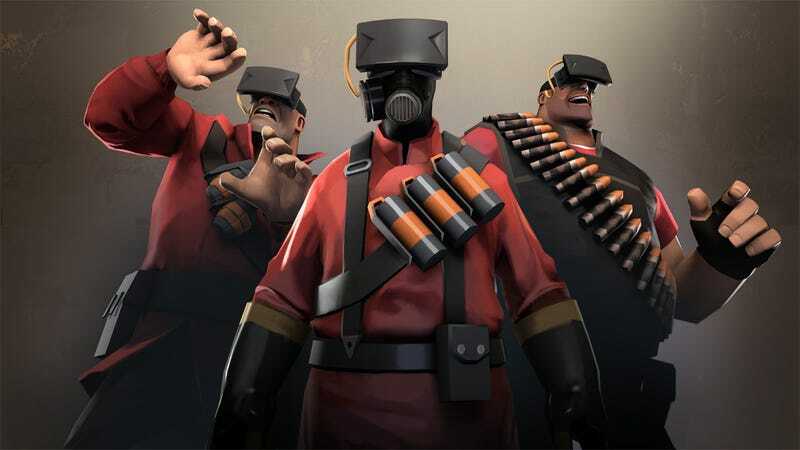 Those with an Oculus Rift developer kit will be able to tinker with virtual reality in Team Fortress 2: to access the VR mode, all you have to do is add "-vr" to your command line options in Steam. From there on out, things sound a little intense according to the Oculus Rift User Guide on the Team Fortress 2 Wiki. Start slow. For the first few sessions, plan to play for no more than ten minutes in VR. Calibrate the device for your eyes. Having the correct IPD helps a lot. Start with some of the slower characters, such as Heavy or Medic. Avoid the faster or close-range characters such as Scout, Pyro, or rocket-jumping with the Soldier - they can produce particularly intense experiences in VR. Stop if you feel unwell. You cannot "push through" motion sickness, it just continues. If it gets bad it can last a long time after you stop playing. As soon as you feel uncomfortable, take the HMD off, take a break and do something else for a while. Many people find that over time they become used to the effects - they get their "VR legs" - and can play for longer without feeling unwell. Some very lucky folks never get any effects at all and can play for many hours. You are freaks and the rest of us are very jealous of you. No more than ten minutes at a time—cripes! Hopefully this is all just stuff you need to do at the start, as you get used to virtual reality. You know, as you get your "VR legs," as they say.